IndieCade had a pretty large establishment at this year's E3 2013 with one of the bigger booths in the South Hall. The event is actually held in Culver City later this year, but the folks from IndieCade wanted to showcase some of the more popular and polished submissions to E3 attendees. 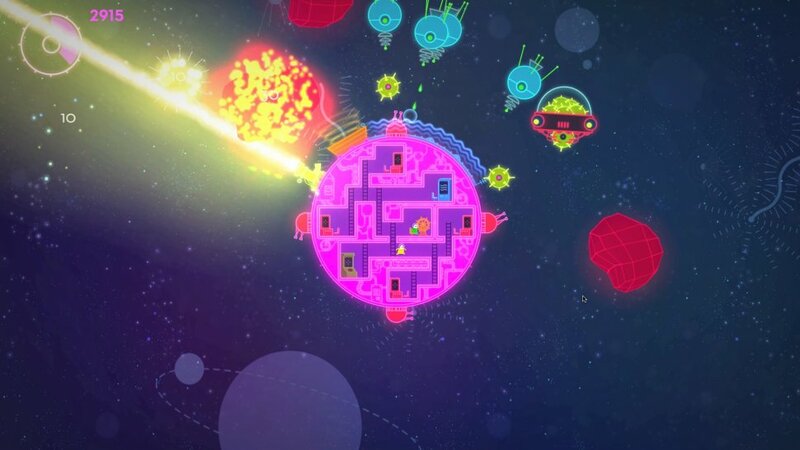 While digging through the troves of indie games we found a little couch co-op gem called Lovers in a Dangerous Spacetime. Lovers is a game about two people on a little Death Star like ship flying through space. Your job is to liberate planets from the evil aliens and survive the trip between. The ship itself has a few stations set up, which you'll navigate to in a platformer like environment. There's ladders to different turrets which you can use for defense on all four sides , there's a terminal you can use to rotate a shield which defends approximately 60 degrees of the orb shaped ship. There's also a terminal that triggers a giant yellow death ray which rotates along the entirety of the ship's hull and wipes out everything. Finally if you work your way to the middle of the ship you'll find steering wheel to maneuver and pilot the ship. The ship itself is upgradable as well, though we didn't get to see that in our demo. The game is two player couch co-op with each person able to move between the different terminals or pilot the ship as needed. The art style of the game features bright neon colors mixed with pixelated style graphics. It's incredibly stylized and charming. My co-op partner and I took to the ship and headed out for the first planet on our radar that needed help. Along the way we were met with numerous aliens to shoot down. We found ourselves sliding and climbing up and down the ladders to defend. Soon though we realized we weren't moving - so one of us had to take the helm and steer the ship. It took a bit to acquaint myself with the steering, basically you move the thruster along the outside of the outside of the ship. Not only did we have to worry about the aliens, but we ran into several asteroids along the way damaging our ship. As we approached the planet we saw tiny people begging to be saved. Unfortunately one of us fired the yellow laser beam of death and killed most of them. The ones we did successfully save after we fought the alien menace sent us love (and healed the ship). Something about Lovers in a Dangerous Spacetime just clicked with both Mike and I. The concept is simple but it's incredibly engaging and fun. Combine the core mechanics with colorful and fun visuals and Lovers is going to be an easy game to crack out at a party or late at night with your significant other. Either way we can't wait to get more when the game is released later this year on PC, Mac and Linux.